The following information is adapted from Questions and Answers of and for the Clockmaking Profession, a compilation of articles on clock repairs by experts such as Joseph Baier, James Tigner and Marvin Whitney, and published by the American Watchmakers Institute Press. The text has been edited to fit the allowed space. What is a 400-day clock? 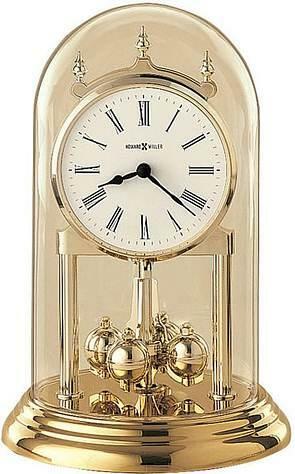 The 400-day clock is a torsion pendulum clock. It is often referred to as an anniversary clock because of its length of run and its popularity as a commemorative gift. The governing unit is a rotating pendulum. The pendulum is hooked to the lower end of a long, thin, narrow suspension spring, a very fine wire. Near the suspension spring’s upper end, there is a clamped fork, with tines loosely embracing the anchor pin, which is a small, round, inch-long pin extending vertically from the pallet frame.Thus, when a wheel tooth escapes, the anchor pin tilts to one side carrying with it the fork,which in turn twists the suspension spring and thereby impulses the pendulum. How many degrees should the pendulum of a 400-day clock swing? In a standard clock, a minimum of 270 degrees – or 3/4 of a turn may be taken as a good indication that the clock will run its full 400 days, provided there is sufficient overswing. What is meant by “overswing”? The overswing is the distance that the pendulum travels after the tick occurs, or the tock. These two distances must be the same on each direction of the rotation, or the clock will slow down and stop prematurely. The overswing at each end must be at least 1/2 inch. The overswing can be adjusted by turning the screw located at the top of the suspension spring in the direction of the shorter overswing. This is a very delicate correction, measured in hundredths of millimetres. Why must a 400-day clock be level? How is it leveled? The clock must be level in order to run properly. The cup under the lower tip of the rotating pendulum indicates the level. The tip should hang in the center of this cup. Some clocks have leveling screws, three generally, which can be adjusted to centre the tip. The clock must always rest on a firm surface. Don’t put it on the piano – use the mantle. This video will show you how to replace a suspension spring on a 400-day clock.